The goal of any Facebook ad is to get someone to click or interact with your page. Right? Of course. 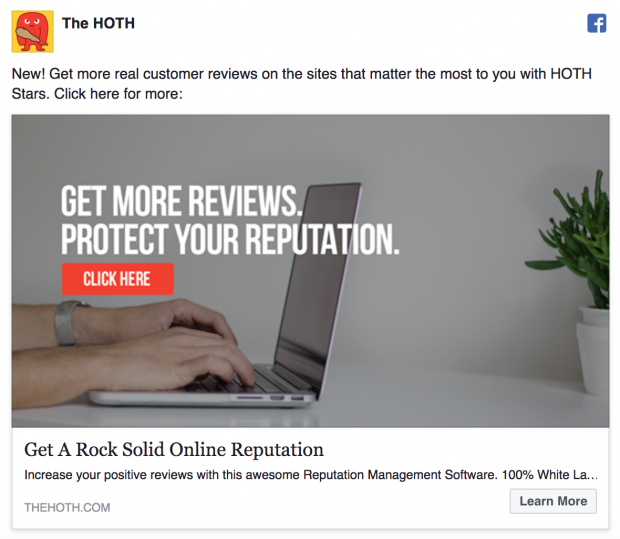 And, as you know, an effective Facebook ad is made up of three carefully crafted parts: the ad copy, the ad image, and the ad headline. It’s a bit like a complex math problem getting them all to work together. So why is so little time spent on a part that they will see first—the ad image? Because so often ad creators are not designers. They’re marketers, social media managers, and content creators. In the past that would have stopped our quest for a perfect ad image. But now with so many graphic design tools at your disposal the lack of a design degree should not stop you from creating a great image. Trust me, I’m not a designer either. But I do know what to do—and what to avoid—when it comes to Facebook ad design. The following tips are curated specifically for non-designers—based on the experiences of a non-designer in a design-heavy company. One of the easiest ways for a non-designer to create a great looking visual for a Facebook ad is to start with a high-quality image. Whether it’s just the base of your content or the main focus, the image you select is a representation of your company. And the wrong one could make a terrible first impression. 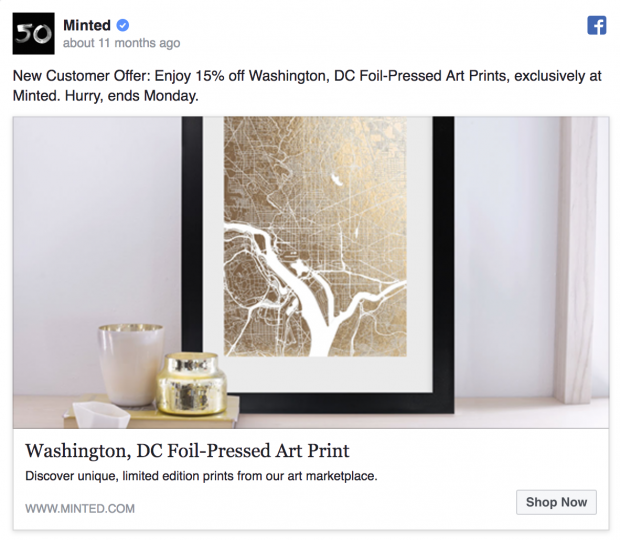 Below, you can see an example of a Facebook ad visual that I would click on from Minted. Not only does it look like they used a high quality social media visual, it is also very aesthetically pleasing. If your image looks like it was taken on a potato, people likely won’t click on it, like in the example below. It could be a great product, but when you present it in a bad way people are likely to ignore it. If you need another great example of using high quality images, check out the one from Artifact Uprising below. They took the time to create an ad image that reflects the quality that their customers can expect. Another way that a marketer can up their Facebook ad game is to avoid using the wrong stock images. I’m all for using stock images in ads because they can help a time-strapped team put together something that looks professional. I have used hundreds of them for featured images, blog posts, and social ads. There are literally millions of free images you can use in your ads, you just have to look. I would recommend starting with Barn Images, Pexels, or Unsplash. It is pretty easy to find stock images, but some people still refuse to take the time to find the right ones. A habit like that might cost you customers. Here is an example of a not-so-great stock photo selection. With this image, I really do not know what the company is selling or why I should click on it. For all we know they could be selling an office chair or white button downs. Below is a great example, again from The HOTH. What makes this second one so much better is that the stock image is not the focal point of the ad. Instead it is used as a background image—letting the text grab the reader’s attention. The good example followed the not so good. 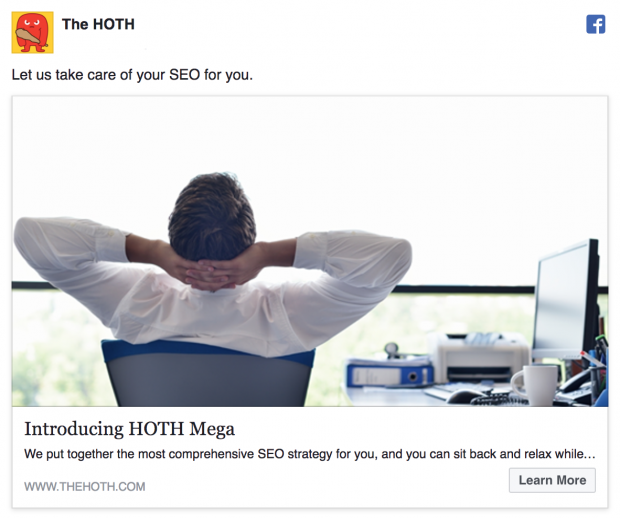 So it looks like The HOTH might have learned a lesson about choosing the right stock photo. Follow their lead and avoid using a random image just because it looks good. 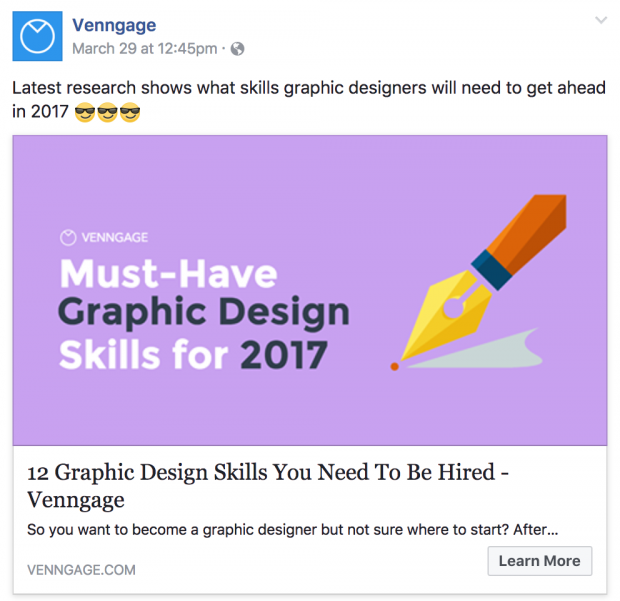 If you are going to use text in your Facebook ad image, make sure someone can read it if they were quickly scrolling through their feed. If not, you’re going to be ignored. 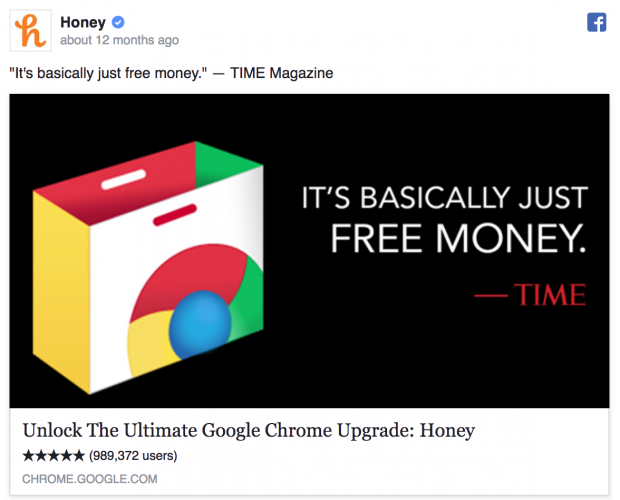 I recommend making sure your text is not only large, but also easy to read on whatever the background color is, like the following Facebook ad from Honey. The text is large and easy to read, which helps it catch the attention of someone pretty quickly. I mean, the “Free Money” part also helps, but the ad itself is well-designed. When I am creating Facebook ad visuals I try to stick to using a white font. It really pops when shown against a dark background. But this tip does not always work, as you can see below. 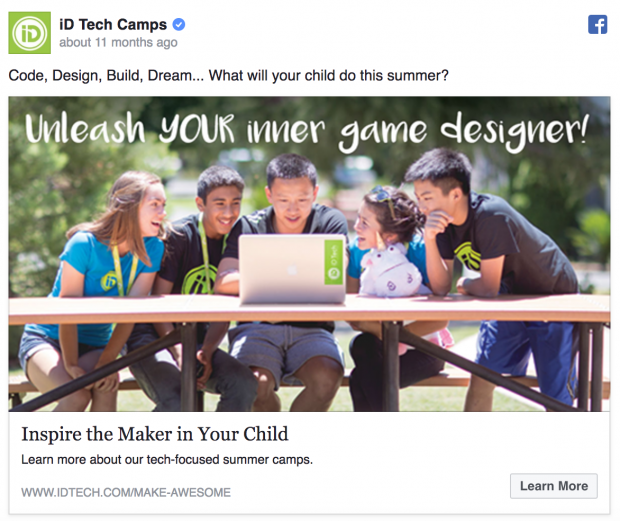 It might have worked if iD Tech Camps had darkened the background image or used a color overlay. But in its current state the text blends into the background, making it harder for the audience to read it. If you must use a lighter background, follow Adzuna’s lead. They make their text readable and eye-catching by using all capital letters and a bold font with a great color. And best of all, this is something a non-designer could put together pretty quickly. Icons and illustrations are a perfect way for a non-designer to fake it until they make it. In fact, most of the design work is done for you already, you just have to know how to use them. Plus these tools are highly customizable. You could use an icon or illustration on just about any ad for any industry. 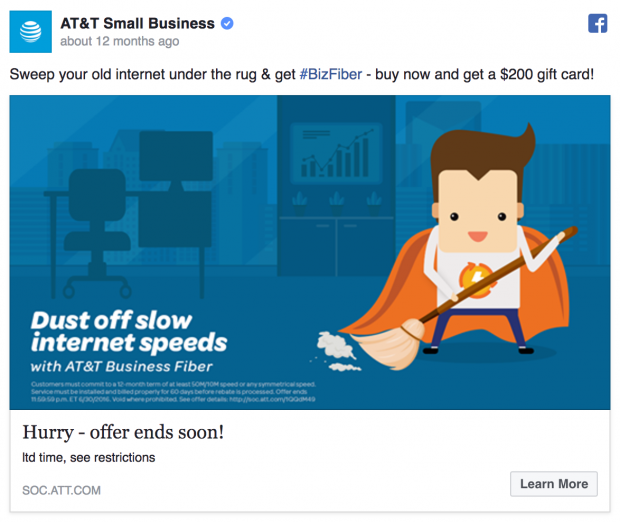 In the above ad, AT&T uses an illustration to appeal to small business owners. They could have listed a bunch of their accolades but that would have turned off a lot of their core audience. Instead they decided to have fun with the design. At Venngage we are also big fans of illustrations and icons, as you can see below. 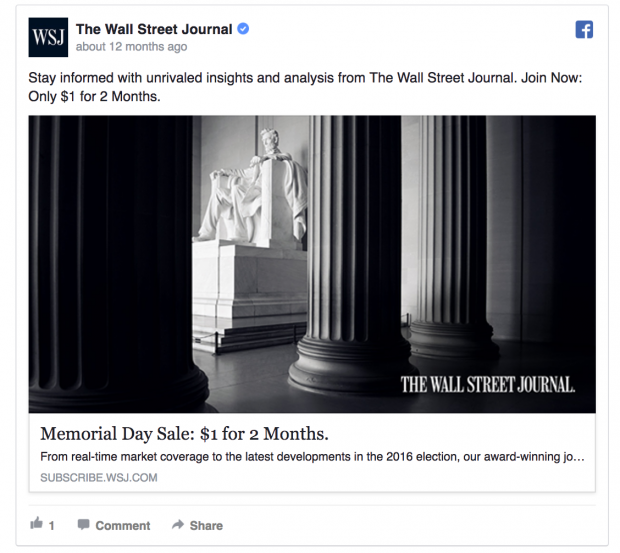 Icons can also be used in Facebook ads to add context to the image or help the reader make a quick conclusion. In the example above, we used a simple ink pen icon to appeal to designers or people who care about design. In my opinion, you should avoid using light backgrounds for Facebook ads. Why? Because the primary color of the Facebook Feed is white. An ad with a white background can easily get “lost” in the feed, like the one from HubSpot below. If HubSpot picked a vibrant or dark color, the ad would stand out better. But with the white background it just blends into the Facebook news feed. And blending in is not the outcome you want when you pay to put something in front of people. If bright and vibrant colors are not your thing, you can follow The Wall Street Journal’s lead in the ad below. In this ad they used a very simple dark color palette that will stand out on Facebook’s white background. Plus it’s a great photo. The dark colors also help you break the ad down into three distinct parts, which makes reading and interpreting the info much easier. 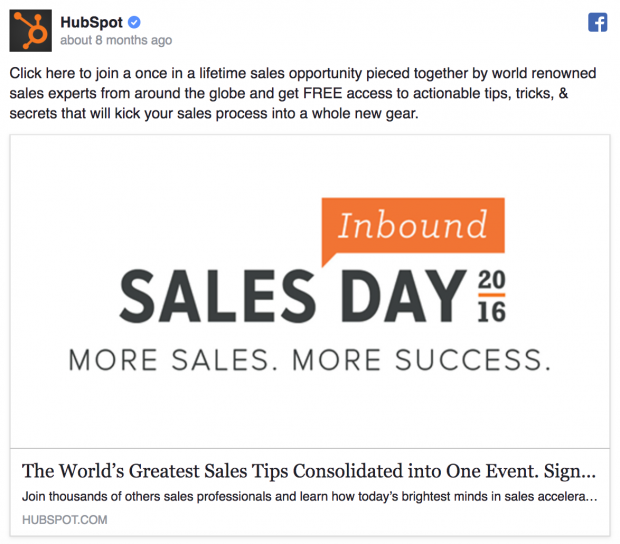 In contrast, the Hubspot ad looked like one big white chunk of content and no real focal point. 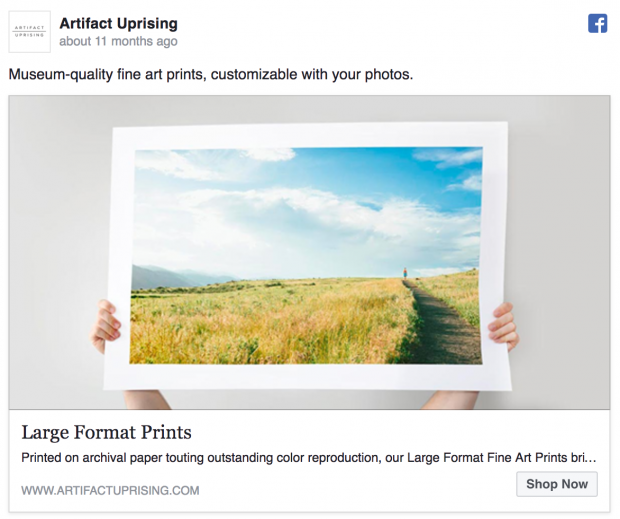 With a white or light background, Facebook users can not easily see where the ad copy, ad image, and ad headline separate. And this will most likely lead to less interactions or clicks on your ad! I would recommend a vibrant and bold color palette that jumps off the page instead. Those are our Facebook ad design tips. 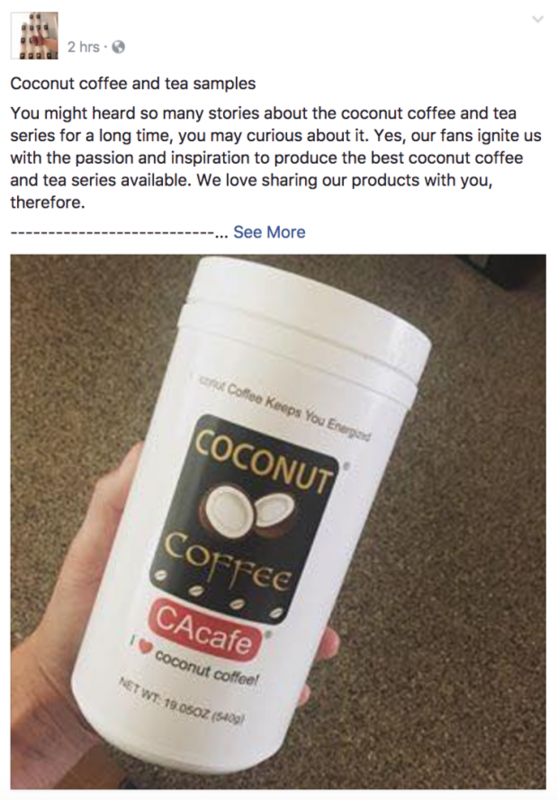 If you need a few more, check out Venngage’s Facebook ad case study. 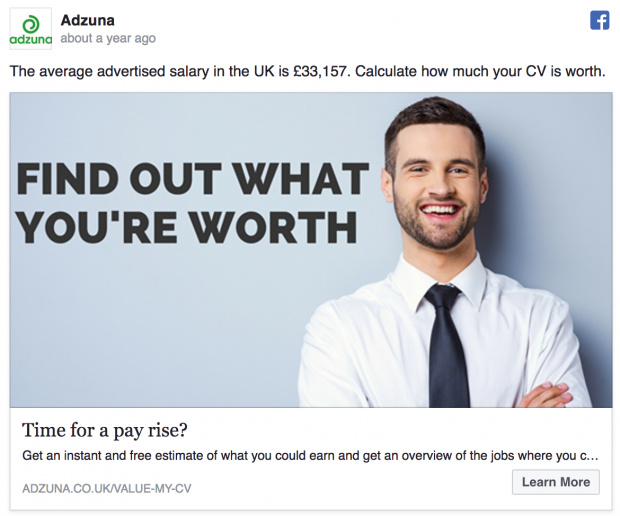 Get the most out of your Facebook ad budget with AdEspresso by Hootsuite or Hootsuite Ads. Both are powerful options that make it easy to create, manage, and optimize campaigns. Ryan McCready is a content editor at Venngage Infographics. He went to the University of Arkansas and graduated with a degree in economics and international business.